Max snookered me into getting him pizza the other night. I'd promised him frozen yogurt, but I hadn't had time to eat dinner after I got home from work and said I wanted to first grab a slice. "I want pizza!" he announced, even though he'd already had dinner. And so, he had pizza as an appetizer for his dessert, or something like that. Pizza is not an easy food for Max to eat; because it's thick and chewy, it can pose a choking hazard. At home, we shred it with Tiny Bites Food Shears. When we're out, I use a knife and fork then dump the pieces into a bowl for Max to scoop out, with a square of tacky Dycem beneath it for stability. And so, I asked the guy at the counter for a fork and knife and carved up a slice. Just as I was about to slide the bits into a bowl, Max pointed to the paper plate. "Max, it's easier to eat from the bowl," I pointed out. "No!" said Max. He wanted to eat the pizza off the plate. So I slid it over to him, then watched in awe as Max speared the pieces and chewed them well. As I sat there, it occurred to me that I don't always know what is best for Max, especially as he's getting older—both because he is evolving, and because he can now tell me what's best for him. This is a hard thing to wrap your head around when you have done so much for your child over the years: the therapies, doing exercises at home, the specialist appointments, modeling how to move and talk and play, yet more therapies, pushing to get him into programs. So. Much. Pushing. And while there is only so much you can do to help your child develop, you take heart in knowing that you are doing everything within your powers. And then one day you are in a pizza joint and realize that your boy is reaching the point where you realize he is capable of co-piloting his present, and future. Yes, he has been voicing opinions and preferences for years, but he hasn't had much to say about his physical challenges until now. And he is telling you what he wants and needs, and you should listen. I have no idea what it feels like to have cerebral palsy and fingers that don't easily bend. If Max is telling me that picking up pieces of pizza is easier done from a plate than a bowl, who am I to disagree? And that, my friends, is the lesson of the pizza bowl fail...and win. 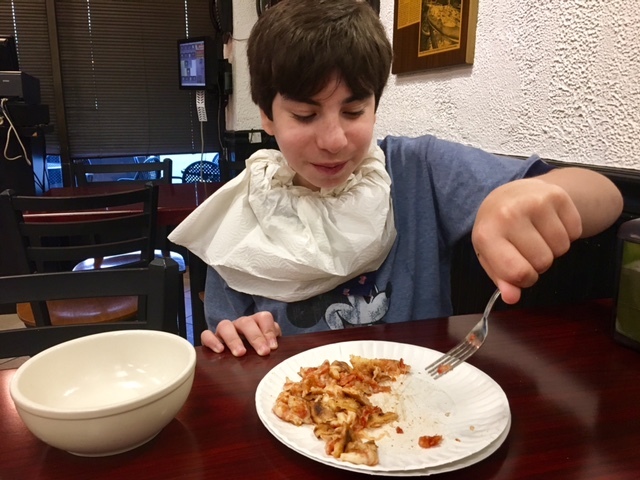 As Max heads to high school the "pizza & plate" incident is another good sign that he is ready to speak up and hold his own in the new world ahead. Exciting for all! HI!!! [Waving in my head at you!] I would so love to hang with you and we could discuss this and All The Things.